Since December 2017 the international coalition led by Saudi Arabia and the United Arab Emirates has intensified its airstrikes against the Houthis in northwest Yemen, leaving the inhabitants more exposed than ever. Just a few kilometres from the frontline is Haydan village in Saada governorate, a mountainous region with almost no medical facilities. The endless barrage of airstrikes has made transport here extremely challenging. 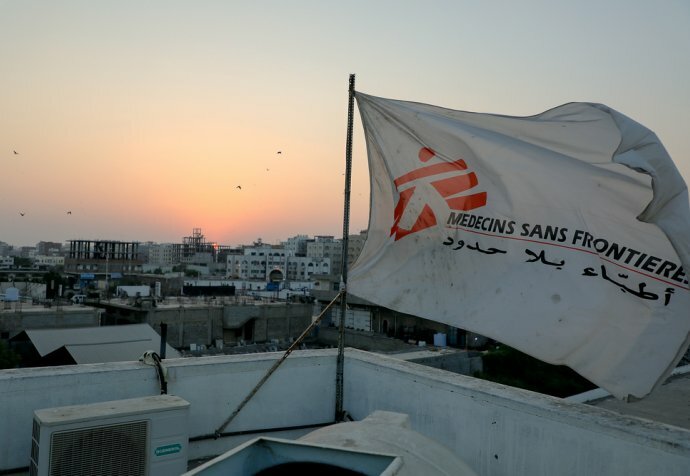 In March 2017, Médecins Sans Frontières teams returned to the hospital in Haydan that had been bombed and destroyed by Saudi warplanes in October 2015. MSF teams provide healthcare to isolated communities in Haydan as well as the remote surrounding area. His face half-hidden by his arm, Mohammad is lying on a bed in the emergency room in the hospital in Haydan. The shrapnel wounds in his leg and abdomen are severe. He waits silently for the ambulance to take him for surgery in another hospital that’s an hour and a half away by road. Mohammad was on his way to Friday prayers at the mosque when he was hit near the Houthi stronghold of Maran, in north Yemen. “One minute I was walking down the road, and then I woke up here. Was it a bomb or a rocket? I have absolutely no idea,” he says. Mohammed lost consciousness with the impact but he was picked up by passers-by who brought him by car to the hospital in Haydan, where MSF stabilises the war-wounded before referring them to one of the hospitals in Saada. Formerly a court clerk in Saada, Mohammad is not a combatant. He fled the fighting in Saada for Yemen’s capital Sana’a where he now lives with his family. He had gone to Saada governorate to try and get his salary, which, like 1.25 million other Yemeni government employees, he has not received since September 2016. Because of the difficulty with transport close to the frontlines, the war-wounded arrive late at the hospital in Haydan and consequently are often in critical condition. Médecins Sans Frontières’ teams refer these patients to hospitals in Saada. “What we see most are bullet wounds and injuries like shrapnel wounds sustained during bombing raids,” explains Frédéric Bonnot, MSF’s project coordinator in Haydan. In March 2018, ground conflict between the Houthis and coalition-supported forces loyal to President Hadi was a daily occurrence on almost all of Saada Governorate’s borders. Particularly badly affected were Kitaf in the east, Baqim in the north and Razeh in the west. Even before the most recent conflict broke out in March 2015, Saada’s inhabitants were among the most vulnerable in the country. The governorate was already the scene of intense fighting during a succession of wars between the Houthis and the then President Ali Abdallah Saleh’s armed forces between 2004 and 2010. President Saleh was assassinated in December 2017. Before 2015, extremely high levels of stunting had already been observed among children under the age of five in Saada governorate. The aerial bombardment campaign began after Houthi missiles were fired towards Saudi Arabia, and its capital Riyadh. “As soon as a missile is fired at somewhere in Saudi Arabia, the Saudis respond almost immediately by bombing Saada,” comments Frédéric Bonnot. © Agnes Varraine-Leca / MSF. On 8 May 2015, the coalition declared all towns in Saada governorate military targets. According to Yemen Data Project, in the past three years, the coalition has carried out 16,749 air raids in Yemen, i.e. an average of 15 a day. Almost a third of the raids have hit non-military sites. Information provided by the Yemen Data Project is obtained from numerous sources and systematically crosschecked. When no independent data is available, they are crosschecked with sources from opposing sides to the conflict as to ensure the reporting is as precise and impartial as possible. 19-year old Qoussor waited an hour and a half on the side of the road before finding a car that would take her and her son to the hospital in Haydan. Baby Nabil is only 6-weeks old and for the past few days he’s had trouble breathing. Even though his mother lives not far away on the other side of the mountain in Maran, the airstrikes that continue day after day mean there is little available transport in the area and the options that remain are expensive, so people have to make hard choices. “It’s really difficult for people in Maran to get around. Either there are no vehicles available because the bombing is too heavy or we don’t have the money to pay for it,” she says. The journey to the hospital had to be made and due to his poor health, Nabil must spend a week in the hospital. Another, somewhat less visible, consequence of the war is the prices of commodities, particularly raw materials, which have risen sharply since 2015. This makes life even tougher and increasingly challenging for people in Yemen. The price of gas and petrol has doubled in the past three years and wheat flour has risen by more than 50%. According to the World Food Programme, imports increased in January and February 2018. But scarcity of essential imported food and fuel commodities continued in March 2018. The reasons for this are several: the imposition of taxes in Sana’a on goods from Aden and other ports in the south of the country, trading practices that include stockpiling merchandise to push prices up, travel restrictions and trafficking associated with the conflict. This situation weighs heavily on the daily lives of people in Yemen. Like Qoussor who, at the age of 19, has known almost nothing but war. Maran, the town where she was born and grew up, suffered from intense conflict during the Saada War, which lasted from 2004 to 2010. Back then, underground shelters were constructed where people could take refuge during airstrikes. Tunnels dug in the mountain lead to caves rarely more than a metre high. Qoussor says that in these caves, “Standing up is impossible”. These shelters are still used by the population when the bombing is fierce and families no longer feel safe in their homes. The last time they were forced to seek refuge, Qoussor and her relatives spent two days in the caves, rationing bread they managed to bring with them.